When choosing a vacation destination, Ensenada and the nearby Guadalupe Valley are often overlooked by Southern California families. This is a shame, as this nearby gateway to Mexico fun and relaxation is closer than you think, and chock full of fun things to do. WCM has the Lucia 40 at Marina Coral and Resort, on the edge of Ensenada. It’s a full-service resort where marina tenants have access to the pool, restaurant, etc. So that might be a weekend by itself. But you would be remiss not include a foray into the green valley to the east, one of the fastest developing wine regions in the world. Beautiful vineyard estates, plush tasting rooms and funky family run wineries are everywhere for your exploration. 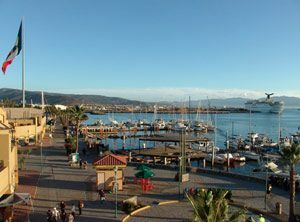 And downtown Ensenada has something for just about everyone. Why not make it a long weekend, and take 3 or 5 days and do it right? Gather your friends and family (4-6 people total), pick a weekend, and get out of town. Enjoy boat living, resort living, Mexico living (and prices! 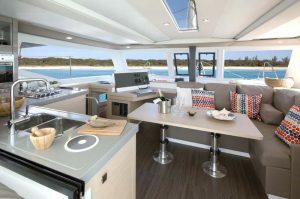 ), do as much sailing as you like, with your captain at the ready, and basically get a taste of the high-end cruising life. Nice! Charters for $1,495 per day, $7,847 per week. Captain required, at small additional cost (will see to the boat at all times, and may tour with guests). Two day minimum for charters. Pricing for any classes will be same as SD rates, plus $195/person for lunch and wine tasting tour of Guadalupe Valley (optional). How Many Sailors in Your Group?